Sooooo Jussie Smollett may have, just may have, colored the truth. The Chicago Police Department might have or might not have botched the investigation into the Empire actor’s alleged beatdown by MAGA-hat-wearing, racist African brothers in whiteface *kanye shrug*. But who seems to really be in the crosshairs in this twisted saga? Smollett? The brothers African? The CPD? Nope. None of them. The real villain in this saga apparently is Kim Foxx, the woman, the black woman in fact, at the helm of Chicago’s Cook County State’s Attorney Office. Well, to hear her critics tell it, it’s an embarrassment and a travesty of national importance that Smollett “got away” with multiple charges of (gasp!) lying to the cops about what had happened to him one frigid night in Chicago during a 2 a.m. run to Subway. 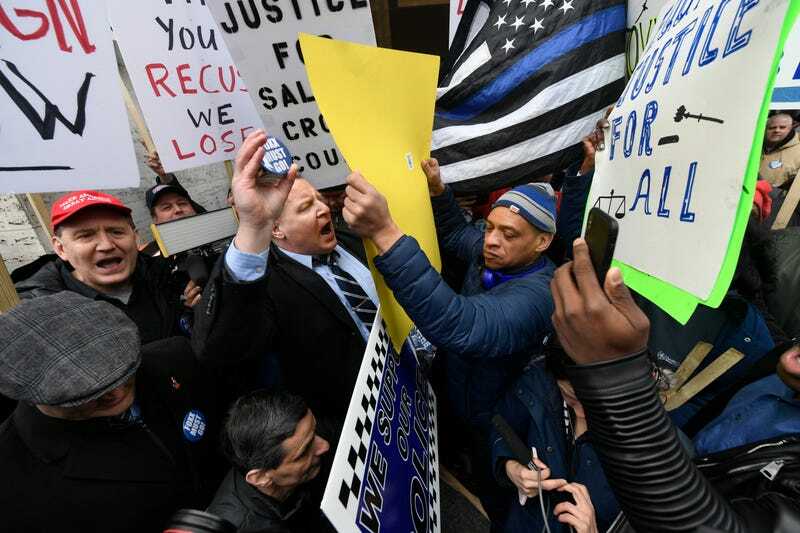 On Monday, members of Chicago’s Fraternal Order of Police stood outside the Cook County Administration Building to call for justice and accountability —or, basically, a return to the good ol’ days when punks and perps, usually of the poor, black and brown variety, had little chance of the kinds of “cushy” Jussie deals involving fines, community service and an expungement of records. According to the po-po, the Smollett case is more outrageous than, than, oh, I don’t know, maybe someone being sentenced to less than seven years in prison for murdering a teenager? But I digress. Back to Kim Foxx. She had her backers, too, Monday, with community activists staging a counterprotest in support of Foxx and directly in the face of the FOP. Yes, as @BLMChi noted regarding the true nature of the FOP’s protest, Chicago is getting ready Tuesday to elect its first black woman as mayor. Maybe, methinks, the FOP doth protest too much.